It does not feel very much like Christmas – weather-wise. After a few days of extreme cold with -10 degrees, where the entire landscape was frozen in sparkly white ice crystals, it is now too warm and a mix between windy grey skies and a moisture in the air. Although Christmas is an adopted Holiday for me I love all of the magical charm Christmas brings along. The Advent calendar, candles, sparkly lights, baubles and decorations all enamour me immensely. My decorations are often natural with lots of wood, earthy colors, wreaths and spices. I like making more personal advent calendars for both my men. For Soeren I made one several years ago - I think he was three – using red and green felt I stitched small bags and decorated each with a Christmas motive and a number 1 through 24. Each year I pack the bags with his favorite chocolates and something small and useful. For my husband I made this grown up naughty boozy calendar with small bottles of schnapps or boozy chocolates - small surprises hidden in the boxes for each day till Christmas Eve. It was an easy readymade template that I put together in two evenings with a few glasses of wine and a piece or two of stollen and Michael Bublé humming through the speakers. The Advent season is an important rich in tradition time in Germany. A big part of the Christmas culture in Germany is Advent, which starts punctually on the first day of December and/or first Advent. 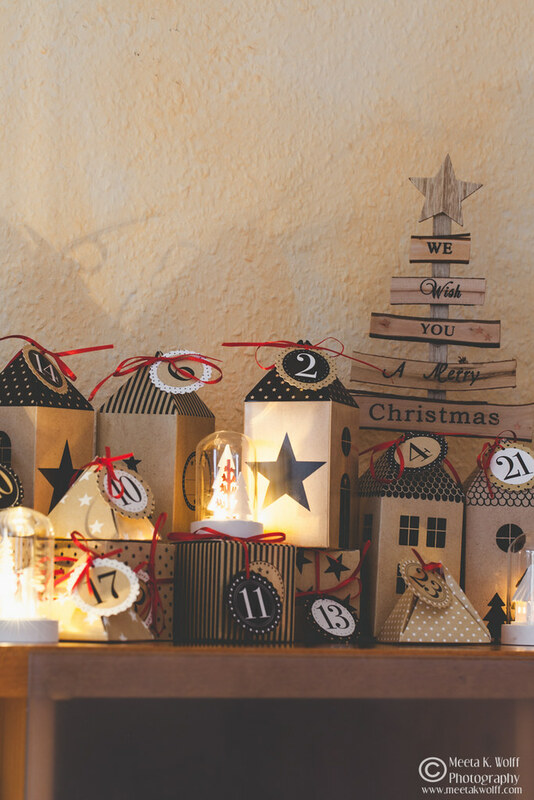 The Advent calendar is the first of the little surprises that actually chime in the countdown to Christmas. The traditional ones made out of card with a little treat hidden behind each “window” or “door” are popular and available in many stores. I prefer the more individual ones, which can be made with fir tree branches, a wreath or just a pieces of string with bags and boxes hanging from them. 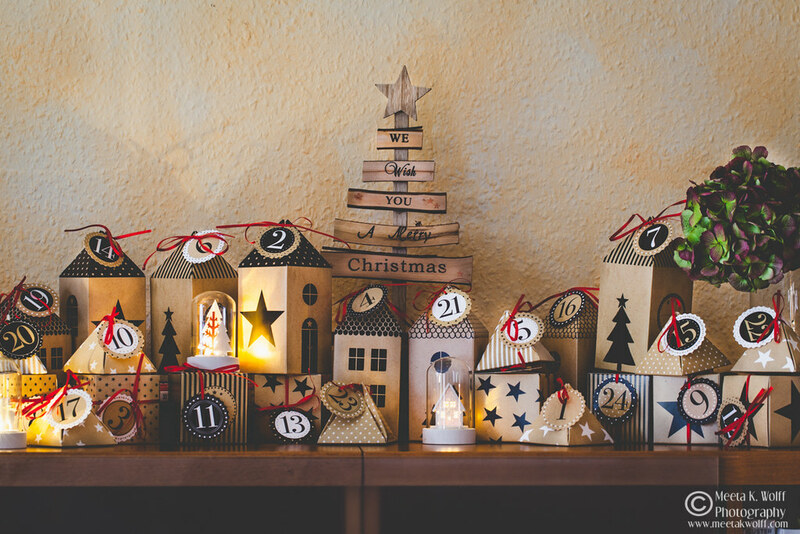 Families wake up every morning and often the first place they head to, is their own personal Advent calendar, feeling the bag or shaking the box trying to guess what is inside. The “Adventskranz” or Advent Wreath is another very German tradition here. Many families in Germany put an Advent wreath on the living room table on the fourth Sunday before Christmas. The wreaths have four large candles and, traditionally, pinecones and berries. Each Sunday before Christmas a candle will be lit until all four candles light the room. The Advent wreath tradition is especially observed in households where the decorated tree is not put up until Christmas Eve. Until then, the Advent wreath provides the heart-warming candlelight and evergreen aroma throughout the month. Each Advent Sunday families gather around and enjoy an afternoon tea and coffee with homemade baked stollen and cookies. 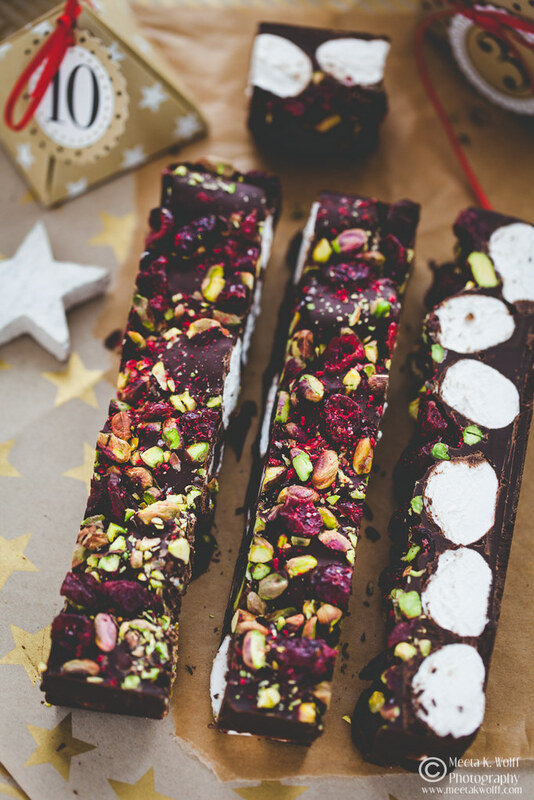 In our home we invite friends and family to enjoy the Christmas cookies, cakes and stollen – sometimes accompanied with some Glühwein. This is what my Adventskranz looks like this year. Over the years we have developed a ritual in our home and each Advent Sunday we bring down one or two pieces of Christmas decoration from our attic. The “Räuchermännchen” the classic incense smokers, the wooden pyramid with long stemmed candles or the “Schwibbogen” – a candle arch, given to me by my inlaws – handcarved from the Ore Mountains or my favorite Nutcracker I found last year at a second hand shop! Christmas markets adorn the center of almost every town and village in Germany. Although the more famous ones like the ones in Nuremburg, Dresden or Munich are well-known across the borders, those charming smaller ones often captivate me more. Apparently there are over 2,500 Christmas markets across Germany each inviting visitors to enter the festive mood. Markets commonly feature a nativity scene, and vendors offer a wide variety of gifts, including many that are still hand crafted, which make great unique presents. There is a wide array of mouthwatering foods like grilled sausages, freshly baked tarts and stuffed breads, fried fish on a fresh bread roll (Backfisch), sautéed mushrooms, roasted chestnuts and candied almonds. There will be fruit punch and Glühwein or mulled wine, crepes and doughnuts – all enticing to take a long stroll through the city. A pivotal part of the Christmas celebration is the Christmas tree and often a matter of great pride. In Germany the trees are commonly real trees and are usually conifers such as fir, spruce or pine. According to German custom the trees are usually brought into the house on Christmas Eve and decorated with candles or strings of lights, as well as a variety of intricate ornaments. The three of us usually pack a thermos with hot chocolate and a few cookies and head out to a little plantation of conifer trees. We walk through the rows and rows of trees, armed with an axe and a saw looking for our perfect three. When it snows there is a magical mood as the snow crackles under our feet and the flakes cover the needles and pinecones. If it rains, our boots squish in the muddy paths while the drops of water gleam on the tips of branches. Warm days and sunny blue skies light up the entire plantation with an uncharacteristic feel. 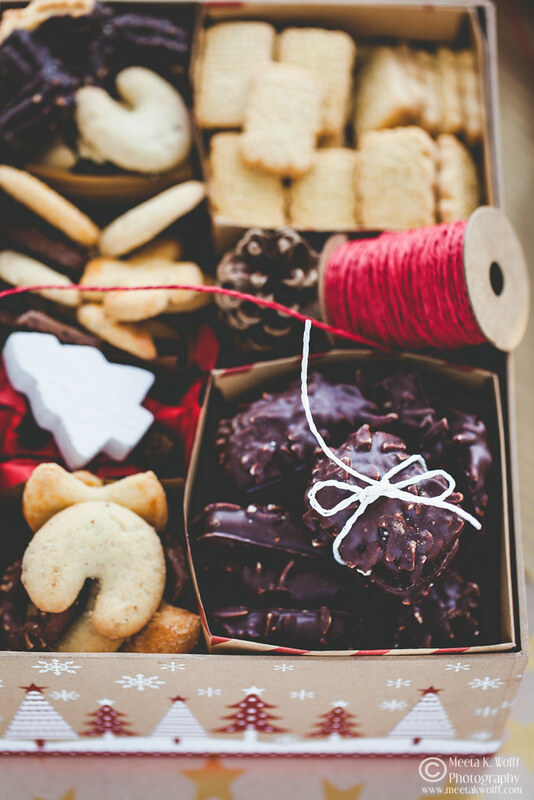 Whatever the weather, our ceremony each year, after we have found that gorgeous tree and after it has slid into the net and loaded into the car, is to sit in the boot of the car, feet dangling and celebrate with our chocolate and those homemade cookies. Cookies are a big part of Christmas for us. Not only are they always the perfect treats during the Advent tea afternoons they make awesome gifts for colleagues, friends and teachers. I make sure to bake enough to give away as presents but also enough for us to indulge all the way till Christmas. This year I was invited to my best friend place to spend an evening of baking. While we baked we opened a nice bottle of wine, lit up candles and put on some Christmas music. My friend’s mother joined us and she brought along all her cookie baking know-how. I was thankful as she has the wonderful ability to shape and form the tiniest of cookies. She also brought along some small wooden spekulatius forms that allowed us to make picture perfect cookies. In my cookie box this year for you are these special butter spekulatius cookies – very traditional and very German, Spritz cookies infused with orange and dipped in rich dark chocolate and the rather untraditionally German, rocky road spiked with fleur de sel, pistachios, freeze dried raspberry and cranberries are decadent and just so good. Other cookies in my cookie box this year were these Norwegian Christmas cookies, my Vanilla Kipferl and these Linzer Cookies with Lingonberry and Cloudberry Jam from last year’s cookie post. Enjoy this year’s cookie post and I hope you find pleasure in baking some of these great recipes. Make enough as they are great gifts – spread the great Christmas spirit and tradition. Line a baking tray approx. 20cm x 30cm with some baking paper. Arrange the marshmallows side-by-side in the tray. Pour over the melted dark chocolate and rap the tray a few times on the counter-top to get rid of any air bubbles and to evenly distribute the chocolate. 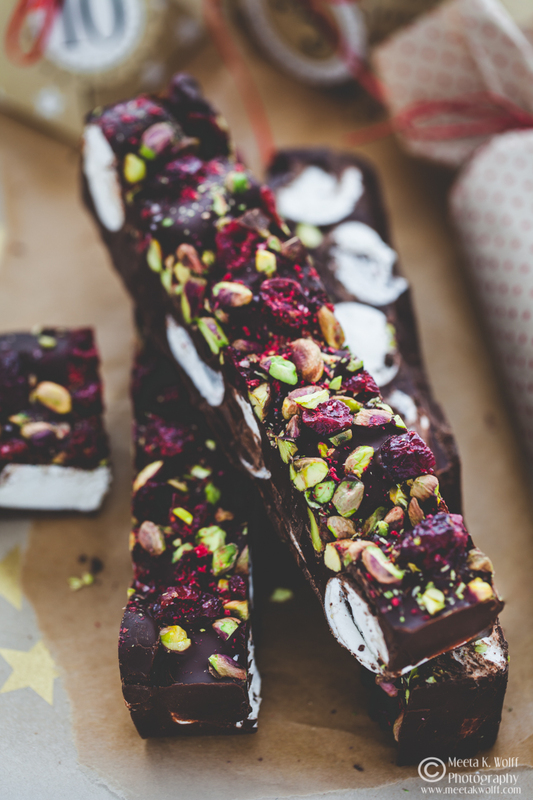 Sprinkle the sea salt, crushed freeze dried raspberries, cranberries and pistachios over the chocolate. Refrigerate for 30 minutes or until the chocolate is set and firm. Using a sharp knife cut into bars or along the sides of each marshmallow for individual portions. These rocky roads will keep for up to a week in a cook dark place. To give these as gifts wrap the bars in some wax paper then wrap in wrapping paper, tying each end with some string. Decorate with wooden stars or pine cones. Individual pieces can be put in small brown paper bags and tied with colorful string and natural decorations - these will be a real eye-catcher. 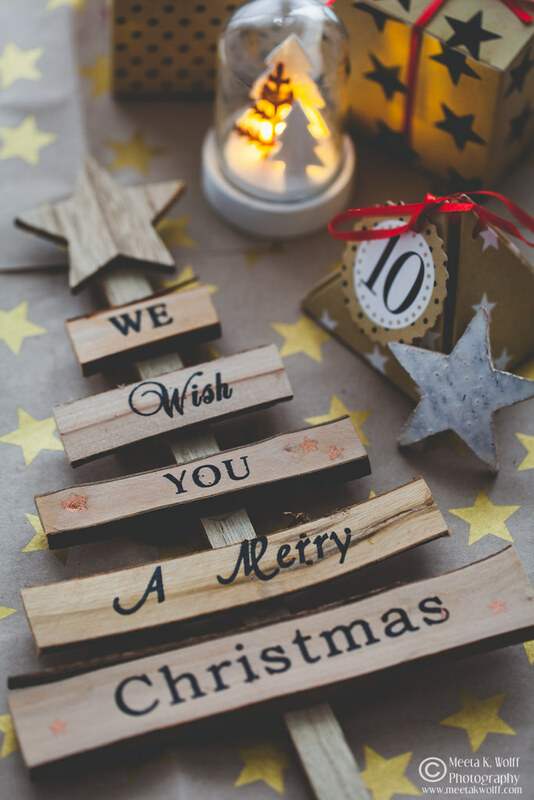 I wish you all a very Merry and Happy Holidays – from my kitchen to yours – lots of icing, frosting, spice and sugar and sweetness, lots of tinsel, baubles and sparkles. 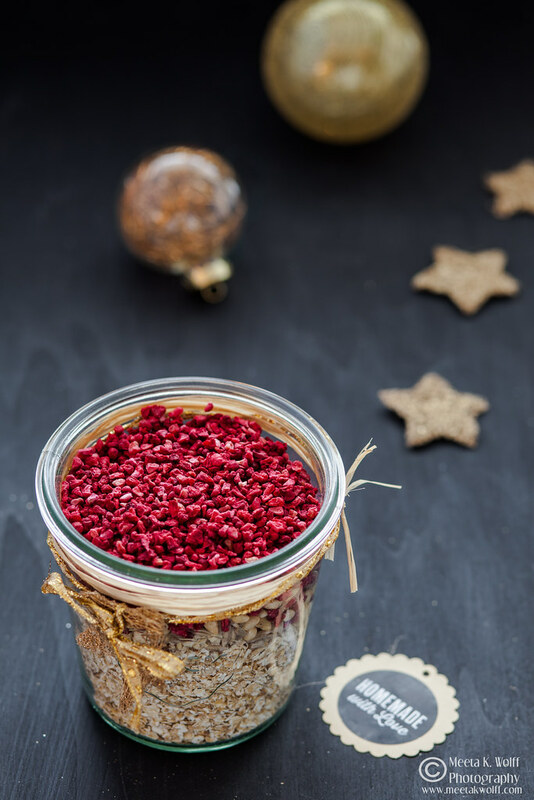 If you are looking for some unique personal gift ideas from your kitchen make sure you check out my post edible gifts in jars. 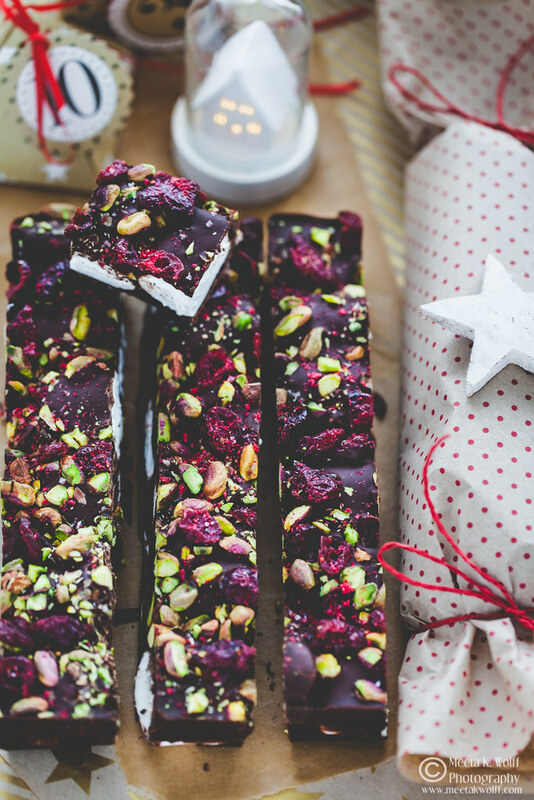 You will find some impressive ideas like these Raspberry Pine Nuts Muesli Bars. I absolutely love old traditions at Christmas, to me it is what makes things feel special. Would be nice to have some "proper" Christmas weather to go along with it, but at least the heating is turned down a little at the moment. 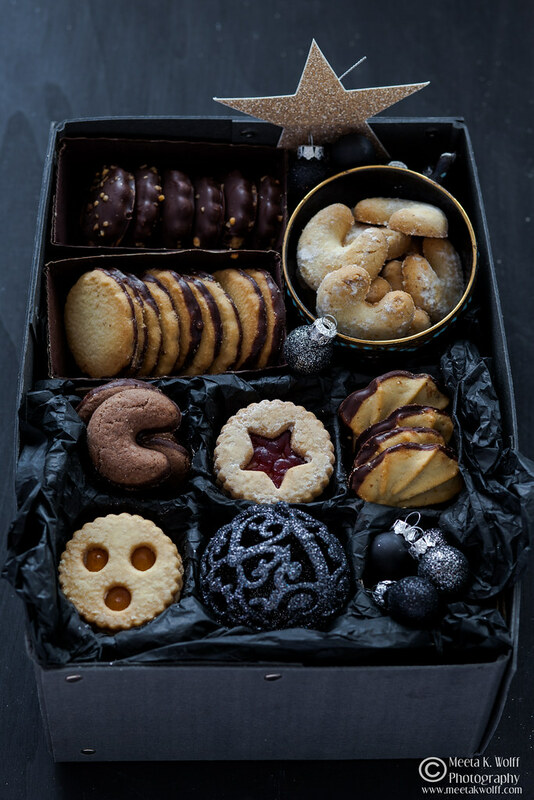 Adore your cookies, they look so special and a real treat. I absolutely love the photography in this post! It is so festive, and making me very excited for the holidays. The advent is beautiful! These look amazing I can't believe you made all those delicious biscuits. Such a great collection of recipes. Awesome. 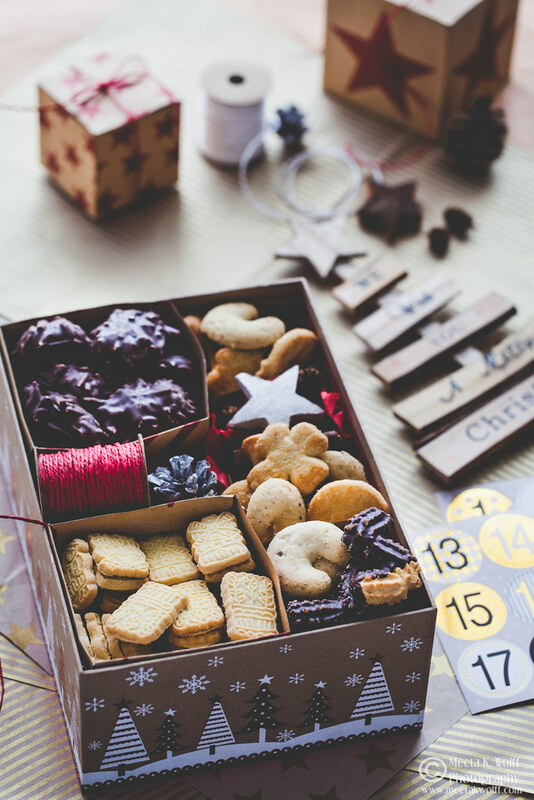 Love your advent calendar, and the cookies looks delicious. These kind so yummy. I love the grown up boozy calendar idea! What fun! Wow. Your photographs and recipes look amazing. I'm pinning the SEA SALT DARK CHOCOLATE RASPBERRY CRANBERRY PISTACHIO ROCKY ROAD for sure! Yum! This is such a beautiful post. Great ideas, great photos. Love it! Where to start. I love the idea of opening up a box everyday with cookies inside. they are wrapped up so cute too! These are beautiful and they look delicious. Love the boxes too! A great little gift with lots of heart. Those all look yummy! Beautiful pics! Cant take my eyes off those rocky road cookies. So yum! Christmas cookies are not part of my tradition but these sure look tasty! I love this post, gorgeous photos! These photos are absolutely gorgeous! I'm definitely in the holiday spirit! 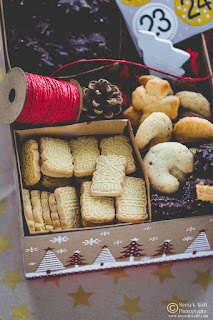 These Christmas cookies looks amazing. Love a good tasty cookie since they're my favorite. Just pinned! Your post made me hungry. I can't wait to try some of these recipes. The photos are gorgeous! I can't find any other awesome adjectives for these foods, just I WANT THEM NOW! Especially that Rocky Road! 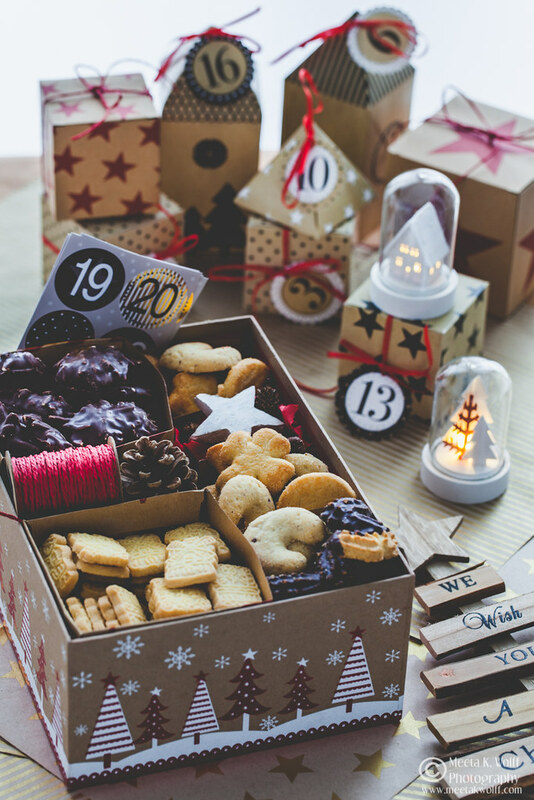 Those all look delicious and I love your advent calendar idea. We just have fox that hangs and you move a wooden candy cane to the appropriate number and then I let the kids have a piece of candy! :) Yours looks so fancy. We have an advent wreath with 4 candles, one for each Sunday before Christmas. I love how you commemorate Advent. 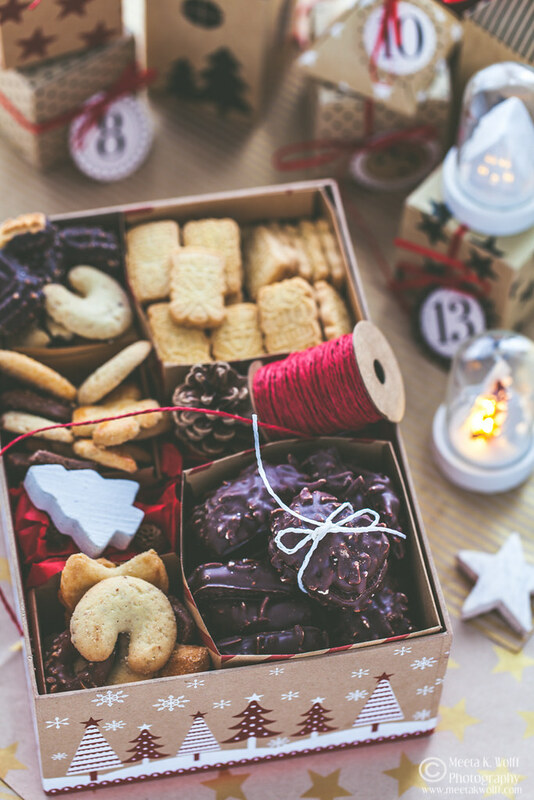 Sharing your time creating these treats for the family to enjoy shows how much you cherish your loved ones. 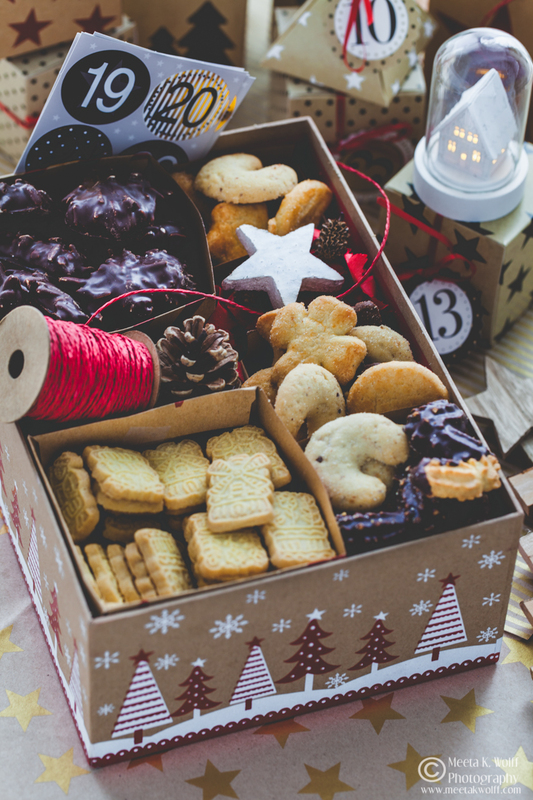 These holiday treats are all tasty looking. 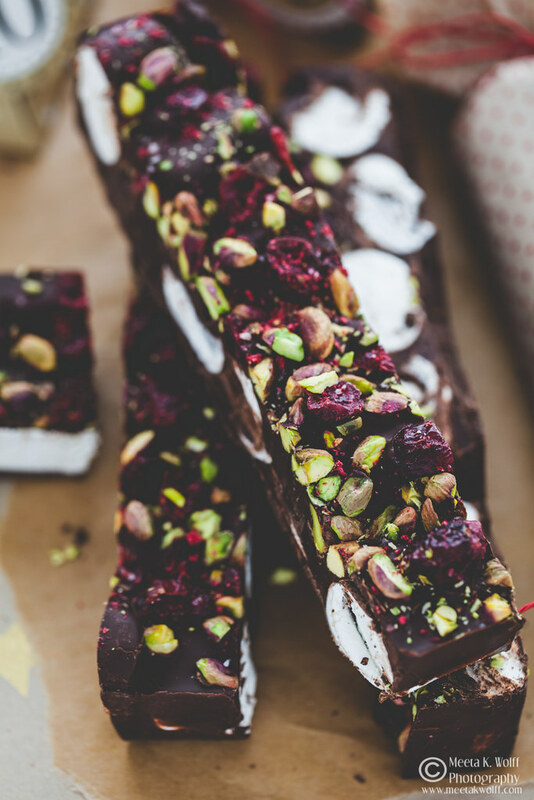 The one that really stands out to me is the sea salt dark chocolate raspberry cranberry pistachio rocky road treat. I just love how they look! NOTHING even comes close to CHRISTMAS cookies - seriously. NOTHING. Oh my goodness, it looks so yummy! Gorgeous photos too! Makes me feel like christmas has already come! Does it come in a Gluten Free version? I want to try ALL of these now!! This was an awesome, detailed post, thank you! you did a great job. i need to start baking, but no desire lol. can i have some of yours? That's so awesome! 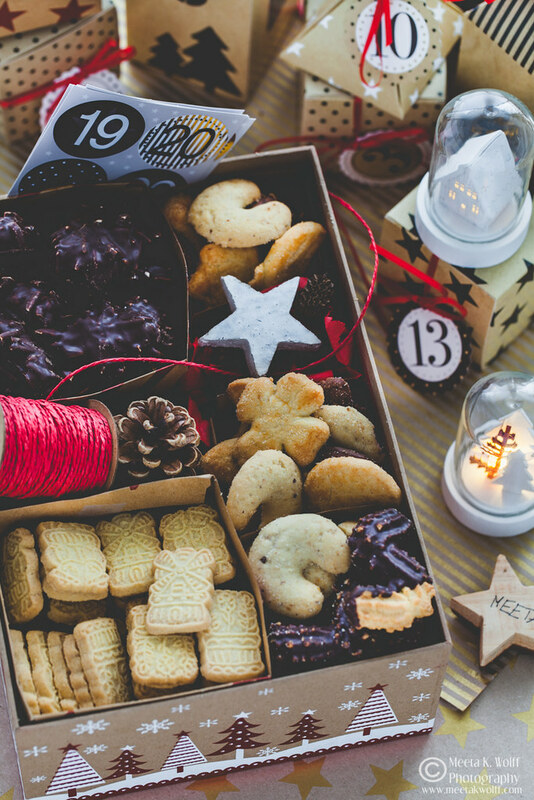 Christmas is never complete without cookies! These would make a lovely gift as well. These cookies look so delicious. I like to try a new kind out every Christmas and this one sounds perfect. I need to have all these cookies. I am pregnant and I am sure I am allowed! Yummy! Lovely post Meeta, the rocky road looks absolutely stunning and so inviting. Happy holidays to you. wow! wow! wow! These cookies look so good! I just love to come to your blog to drool on the images..